Hayles, J.A., Cao, X., Bao, H. (2017) The statistical mechanical basis of the triple isotope fractionation relationship. Geochem. Persp. Let. 3, 1-11. This article is in the top 10 most viewed articles over the last 12 months. Multiple stable isotope relationships have found a growing variety of uses in geochemistry and cosmochemistry. Approximations to the statistical-mechanical models for predicting isotope effects have led to the notion that mass fractionation laws are constrained to a “canonical” range of possible values. Despite previous work indicating that these mass fractionation exponents can be highly variable, the concept of a constant relationship remains common. In this study, we demonstrate generically that the mass fractionation exponent, θ, can take any value for small fractionations and that these deviations are measurable. In addition, we characterise and advocate the use of the change/difference in cap-delta as a necessary and more reliable descriptor of multiple isotope fractionation relationships. Deviations from the “canonical” range are demonstrated by experimental data in the geochemically relevant haematite-water system. 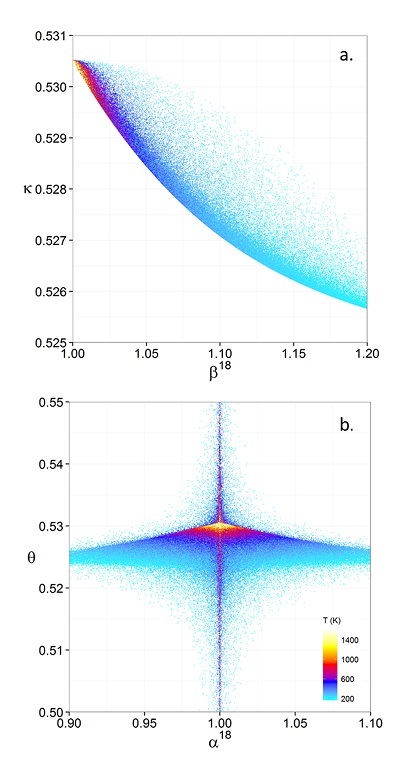 Figure 1 (a) β18 vs. κ and (b) Equilibrium α18 vs. θ plots for randomly selected hypothetical diatomic molecules under the harmonic approximation in the 16O-17O-18O system. Temperature is plotted as colour on the same scale for both plots. The model uses 1,000,000 evenly distributed randomly generated values for the secondary mass (0-300 AMU), the bond force constant (0-kUL), and temperature (200-1600 oK). The bond force constant for carbon monoxide (CO) is used as an arbitrary upper limit (UL) for the bond force constant for diatomic oxygen species. 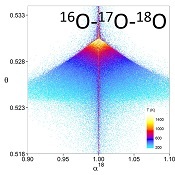 Figure 2 Temperature vs. Δ(Δ17O) plot for equilibrium between randomly selected diatomic molecules under the harmonic approximation in the 16O-17O-18O system. A C value of 0.5305 (HTL) is used for the Δ(Δ17O) definition. 1000 ln α18 is plotted as colour. The range of Δ(Δ17O) values in this plot is expected to be an overestimate for natural samples. The points in this model each correspond to a point in Figure 1a. Figure 3 Three isotope fractionation parameters for haematite synthesis conducted by Bao and Koch (1999). Values are calculated from newly measured δ18Ohaematite and δ18Owater values, and an assumed Δ17O (C = 0.528) of 0.02 ‰ for the water based on reported Baltimore tap water from Li et al. (2015). Δ(Δ17O) are reported using C = 0.5305. The method for calculating uncertainties can be found in the Supplementary Information. Best fit curves for the ln (α) values are second order polynomials of 1/T. The best fit curves for Δ(Δ17O) and θ are calculated from the fits to ln (α). Table S-1 Results from both previous δ18O (converted to logarithmic definition) measurements from Bao and Koch (1999) and new δ’18O and Δ17O analysis from this study. δ'17O values for the water are calculated using the δ’18O values for the water measured by Bao and Koch (1999) and published Δ17O values for Baltimore tap water (Li et al., 2015). Values of α are for haematite precipitation with oxygen sourced from water (αhaematite-water). The method for determining uncertainties is described in the text of the Supplementary Information. All uncertainties are 1 σ.
Farquhar, J., Bao, H.M., Thiemens, M. (2000) Atmospheric influence of Earth's earliest sulfur cycle. Science 289, 756-758. Bao, H.M., Lyons, J.R., Zhou, C.M. (2008) Triple oxygen isotope evidence for elevated CO2 levels after a Neoproterozoic glaciation. Nature 453, 504-506. Blum, J.D., Sherman, L.S., Johnson, M.W. (2014) Mercury isotopes in Earth and Environmental Sciences. In: Jeanloz, R. (Ed.) 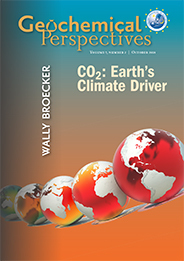 Annual Review of Earth and Planetary Sciences. Vol 42. Annual Reviews, Palo Alto, 249-269. Clayton, R.N., Grossman, L., Mayeda, T.K. (1973) Component of primitive nuclear composition in carbonaceous meteorites. Science 182, 485-488. Bao, H., Cao, X., Hayles, J.A. (2015) The confines of triple oxygen isotope exponents in elemental and complex mass-dependent processes. Geochimica et Cosmochimica Acta 170, 39-50.
using a broadly approximate treatment for elemental processes (i.e. equilibrium and kinetic isotope effects). The intrinsic relationships among temperature (T), isotope fractionation factor (α), and three-isotope exponent (θ) in mass-dependent elemental processes at equilibrium have not been explored theoretically. Urey, H.C. (1947) The thermodynamic properties of isotopic substances. Journal of the Chemical Society, 562-581. Bigeleisen, J., Mayer, M.G. (1947) Calculation of equilibrium constants for isotopic exchange reactions. Journal of Chemical Physics 15, 261-267.
. Their development of the concept of reduced partition function ratio (RPFR or (s/s’)f) allowed for the calculation of α between two species using only the harmonic vibrational frequencies for each degree of freedom and temperature. Wolfsberg, M. (1972) Theoretical evaluation of experimentally observed isotope-effects. Accounts of Chemical Research 5, 225. ). Importantly, the β in Equation 2 is modified with a subscript “harm” to indicate that this term only represents the contributions to isotope partitioning from the harmonic portions of molecular vibrations. The B-GM-U model is successful as it gives the dominant contribution to the value of β to a point near or better than analytical precision for most isotope systems. However, for molecules bearing light isotopes, particularly hydrogen, contributions from anharmonicity, non-classical rotations and rotational-vibrational interactions become significant. Modifications of the B-GM-U model in the form of multiplicative terms have been developed to correct these inaccuracies. Here we use the term “contribution” to specifically indicate multiplicative terms. Each contribution (e.g., harmonic vibrational, anharmonic vibrational, rotational, imaginary etc.) is treated as having its own parameter, such as β, which is only a portion of the complete parameter. Swain, C.G., Stivers, E.C., Reuwer, J.F., Schaad, L.J. (1958) Use of hydrogen isotope effects to identify the attacking nucleophile in the enolization of ketones catalyzed by acetic acid. Journal of the American Chemical Society 80, 5885-5893. Matsuhisa, Y., Goldsmith, J.R., Clayton, R.N. (1978) Mechanisms of hydrothermal crystallization of quartz at 250 °C and 15 kbar. Geochimica et Cosmochimica Acta 42, 173-180. Young, E.D., Galy, A., Nagahara, H. (2002) Kinetic and equilibrium mass-dependent isotope fractionation laws in nature and their geochemical and cosmochemical significance. Geochimica et Cosmochimica Acta 66, 1095-1104. Young, E.D., Kohl, I.E., Warren, P.H., Rubie, D.C., Jacobson, S.A., Morbidelli, A. (2016) Oxygen isotopic evidence for vigorous mixing during the Moon-forming giant impact. Science 351, 493-496. Kaiser, J., Rockmann, T., Brenninkmeijer, C.A.M. (2004) Contribution of mass-dependent fractionation to the oxygen isotope anomaly of atmospheric nitrous oxide. Journal of Geophysical Research-Atmospheres 109, 11. Eiler, J., Cartigny, P., Hofmann, A.E., Piasecki, A. (2013) Non-canonical mass laws in equilibrium isotopic fractionations: Evidence from the vapor pressure isotope effect of SF6. Geochimica et Cosmochimica Acta 107, 205-219. Skaron, S., Wolfsberg, M. (1980) Anomalies in the fractionation by chemical-equilibrium of O-18-O-16 relative to O-17-O-16. Journal of Chemical Physics 72, 6810-6811. Deines, P. (2003) A note on intra-elemental isotope effects and the interpretation of non-mass-dependent isotope variations. Chemical Geology 199, 179-182. Otake, T., Lasaga, A.C., Ohmoto, H. (2008) Ab Initio Calculations For Equilibrium Fractionations In Multiple Sulfur Isotope Systems. Chemical Geology 249, 357-376. Kotaka, M., Okamoto, M., Bigeleisen, J. (1992) Anomalous mass effects in isotopic exchange equilibria. Journal of the American Chemical Society 114, 6436-6445.
) have come to the same conclusion. Cao, X.B., Liu, Y. (2011) Equilibrium mass-dependent fractionation relationships for triple oxygen isotopes. Geochimica et Cosmochimica Acta 75, 7435-7445.
, it is expected that polyatomic molecules will behave within or near the diatomic boundaries of κharm presented here. For all calculated results for hypothetical diatomic molecules, the values of κharm are found to not exceed the boundaries given by Equations 9 and 11. Figure 1 displays the relationships between (a) β and κ and (b) θ and α for equilibrium between hypothetical diatomic molecules containing oxygen under the harmonic approximation with temperature plotted as colour. A key finding here is that the diatomic model allows θ to hold any value for small fractionations. Polyatomic molecules incorporate additional degrees of freedom which will weaken the relationship between κ and β. Therefore, this result is a conservative estimate of the distribution of θ. Much like values of α for a two isotope system, the variability of θ becomes greater at lower temperatures. Because anharmonic corrections are small relative to the harmonic contribution and have a similar mass dependency, anharmonic corrections do not have a significant effect on the distribution of θ values. The effects of anharmonic corrections are addressed in more depth in the Supplementary Information. For kinetic isotope effects, the value of κ for the transition states imaginary frequency contribution is also discussed in the Supplementary Information. The results indicate that values of θ for kinetic isotope effects are more variable and on average, but not strictly, lower than those of equilibrium isotope effects. Although κ is expected to be bounded to a first-order approximation by the high temperature and lower limits as described above, the more common mass-dependent fractionation exponent, θ, is not. What is needed is an additional descriptor for multiple isotope fractionation relationships that is bounded for small isotope effects. Measured multiple isotope relationships are commonly expressed in the “cap-delta” notation. typically either in “per mille” or “per meg”, where C is a somewhat arbitrary constant and R is the molar ratio of one isotope and a reference isotope of the same element. For example, Δ‡M becomes Δ17O for the 16O-17O-18O system and ln (R‡sample/R‡standard) = δ'17 O. Sharp, Z.D., Gibbons, J.A., Maltsev, O., Atudorei, V., Pack, A., Sengupta, S., Shock, E.L., Knauth, L.P. (2016) A calibration of the triple oxygen isotope fractionation in the Sio2–H2O system and applications to natural samples. Geochimica et Cosmochimica Acta 186, 105-119. ). Kinetic isotope effects should have more variable Δ(Δ17O) values because of their more variable κ values, however the range is expected to be similar to that of equilibrium isotope effects. Regardless of the value of C, Δ(Δ‡M) will approach a high temperature limit of 0 because both β values approach a high temperature limit of 1.000. We recommend the use of the high temperature limit of κ for C which will ensure that the (C-κ) terms in Equation 14 remain positive. For sufficiently different β values (i.e. non-small values of ln α*A-B) the sign of Δ(Δ‡M) will be determined by the larger β. For positive ln α*A-B values, Δ(Δ‡M) will tend to be negative and vice-versa. This trend is not necessarily expected when α is near unity, particularly at low temperatures. Bao, H.M., Koch, P.L. (1999) Oxygen isotope fractionation in ferric oxide-water systems: Low temperature synthesis. Geochimica et Cosmochimica Acta 63, 599-613.
haematite (Fe2O3)-water fractionation was measured over a range of near-surface temperatures. Nine samples are selected from this study for new triple oxygen isotope analysis. Details of the analysis and the tabulated results can be found in the Supplementary Information. The new calculated fractionation parameters with their uncertainties and best fits are illustrated in Figure 3. Li, S.N., Levin, N.E., Chesson, L.A. (2015) Continental scale variation in O-17-excess of meteoric waters in the United States. Geochimica et Cosmochimica Acta 164, 110-126.
. Δ(Δ17O) are reported using C = 0.5305. The method for calculating uncertainties can be found in the Supplementary Information. Best fit curves for the ln (α) values are second order polynomials of 1/T. The best fit curves for Δ(Δ17O) and θ are calculated from the fits to ln (α). From the calculated haematite fractionation parameters, it is clear that the crossover temperature is different for α17 and α18. With one exception, every experimentally measured θ value exists outside of the typical “canonical” range of θ (approximately 0.5000 to 0.5305) to beyond 1 σ uncertainties. Despite the variability in θ, Δ(Δ17O) values remain within a range of -0.026 ‰ to -0.226 ‰ within the theoretically predicted mass dependent range. Using the simplest application of the B-GM-U model, it is shown theoretically that values of the mass fractionation exponent, θ, are unbounded and particularly variable for small fractionations and at low temperatures. This is in contrast to the mass-fractionation exponent, κ, which is bounded by upper and lower limits. As a supplemental mass-fractionation descriptor, Δ(Δ‡M) is suggested on a theoretical basis because it remains within a finite range for mass-dependent fractionations. The haematite-water system at near surface temperatures is cited as an example of deviations from the “canonical” range of θ for oxygen. These deviations are found to be consistent with a finite range of Δ(Δ17O). It is our opinion based on the results of this study that even for elemental processes the concept of a “canonical” range of θ values is not well founded and should be applied with caution. Financial support is provided by US NSF grant EAR-1251824, China NSFC grant 41490635 to HB. The three isotope relationship was recently re-investigated for complex processes by Bao et al. (2015) using a broadly approximate treatment for elemental processes (i.e. equilibrium and kinetic isotope effects). 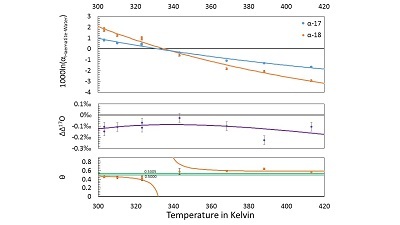 In Bao and Koch (1999) haematite (Fe2O3)-water fractionation was measured over a range of near-surface temperatures. Figure 3 [...] Three isotope fractionation parameters for haematite synthesis conducted by Bao and Koch (1999). Multiple stable isotope ratios have, among other uses, found utility as tools to elucidate photochemical (Farquhar et al., 2000; Bao et al., 2008) or magnetic isotope effects (Blum et al., 2014) and as an identifying markers for extraterrestrial materials (Clayton et al., 1973). The first accurate model for predicting the separation of isotopes for equilibrium processes was published independently by Urey (1947) and Bigeleisen and Goeppert-Mayer (1947; the B-GM-U model). Analogously to the concept of β, Cao and Liu (2011) first introduced the concept of κ defined as the one species analogue of θ, or where β is the one species fractionation factor for the two-isotope system. In this case, the value of κ decreases with increasing mass of the non-substituted atom (Cao and Liu, 2011). Studies investigating these scenarios for sulphur (Deines, 2003; Otake et al., 2008) and hydrogen (Kotaka et al., 1992) have come to the same conclusion. Additional evidence against a universal κ - β* relationship can be found in studies implicating crossovers for θ values approaching infinity (Kotaka et al., 1992; Deines, 2003; Otake et al., 2008). Here, “canonical” refers to a θ value being within certain range represented by most of the observed cases and theoretical justifications (e.g., 0.50-0.5305 for the 16O-17O-18O system; Eiler et al., 2013). Due to the use of the “low-u” (see Eq. 3) approximation of Equation 2, it was commonly believed that the value of the three isotope exponent was somewhat constant and later thought to be constrained to a finite, “canonical”, range for mass-dependent processes which remains as an accepted idea (Swain et al., 1958; Matsuhisa et al., 1978; Young et al., 2002, 2016; Kaiser et al., 2004). Figure 3 [...] Values are calculated from newly measured δ18Ohaematite and δ18Owater values, and an assumed Δ17O (C = 0.528) of 0.02 ‰ for the water based on reported Baltimore tap water from Li et al. (2015). This value is comparable to measured values for silica-water fractionation near 0 °C (Sharp et al., 2016). Using a theoretical framework which represented strictly mass dependent scenarios, Skaron and Wolfsberg (1980) showed theoretically for oxygen isotope partitioning that θ can vary from positive to negative infinity for crossover scenarios, situations where the fractionation factor α for transitions from greater than 1 (heavier isotopes partitioned to A) to less than 1 (heavier isotopes partitioned to B) or vice-versa with changing temperature. Equation 10 is the same as the approximation to the mass fractionation law used by Swain et al. (1958) for triple-hydrogen system. Using the arguments of Swain et al. (1958), it is expected that polyatomic molecules will behave within or near the diatomic boundaries of κharm presented here. The harmonic contribution can be separated into the product of three terms: (a) the Teller-Redlich product rule (TRPR) term; (b) the zero-point energy (ZPE) contribution; and (c) non-zero point energy contributions (EXC) (Wolfsberg, 1972). which has a constant value equal to the high-temperature limit for harmonic vibrations. The zero-point energy of the remaining anharmonic term, which gives the majority of the correction, is given by 𝜔x / 4 which yields a κ value also equal to the correction from G0. The constancy of this value, although treated as the complete correction, was originally determined by Cao and Liu (2011). The κ values for the excited state contributions to this term as well as higher order corrections are not calculated here but have respective β values that are expected to be small enough to mostly be neglected for any system. The effect of anharmonic corrections on the value of κ is treated in the same manner as additional vibrational degrees of freedom so that the final κ value is equal to the sum of the ln β weighted contributions from the anharmonic correction and harmonic κ values. Because the anharmonic corrections are small (<5 % for hydrogen) relative to the harmonic contribution and have a predictable and equal κ value, incorporation of the anharmonic correction yields only a slightly lower value of κ than the harmonic model. 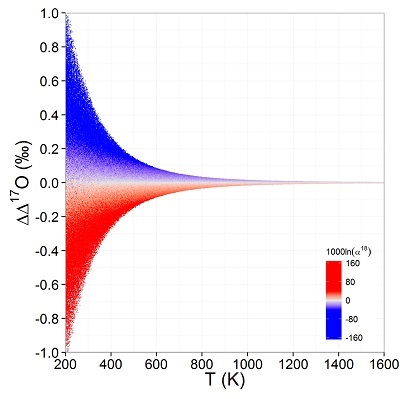 Although the small percent change in the value of κ is valid for polyatomic molecules, the value of κ may not necessarily be equal to the harmonic high temperature limit. As a result, incorporation of the anharmonic correction may not strictly decrease κ relative to the harmonic model for polyatomic molecules, but its effect will still be small. where μ corresponds to the reduced mass of the decomposition fragments. Because the imaginary frequency contribution to β is always less than 1.000, the result of Equation S-5, on average, results in higher values of κ for transition states, but a higher value is not necessarily the case. Because of this, κ for the transition state including the imaginary frequency contribution does not remain bounded by the harmonic limits described above but should remain within or near those boundaries for species with large contributions from other vibrational degrees of freedom. The result is that θ for kinetic isotope effects have a wider distribution than for equilibrium isotope effects. As previous research has shown, normal kinetic isotope effects are expected to exhibit, on average, lower values of θ (Young et al., 2002; Bao et al., 2015). However, we emphasise that kinetic isotope effects should not be strictly associated with low θ values, but rather, more variable θ values. The iron oxide materials used for this study were originaly precipitated for a study by Bao and Koch (1999). The iron oxides were stored as dry powders for nearly a decade and a half in centrifuge tubes since their original precipitation and processing. All processing of the samples apart from the new triple oxygen isotope analysis were conducted for the original study (Bao and Koch, 1999). From the available samples, 9 synthetic haematite samples were selected based on the process used. All selected samples were precipitated from NaOH + HCO3- solutions (molar ratios OH / Fe ≈ 3, HCO3- / Fe ≈ 0.7) at various temperatures for times ranging from 24 hours to 190 days depending on reaction temperature. Samples using this precipitation procedure were chosen because this procedure consistently generated haematite (as opposed to goethite and akaganeite) over the entire temperature range. The samples were then washed in a HCl solution to eliminate amorphous phases and then dried. 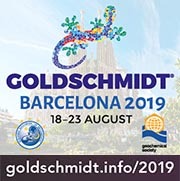 XRD results for the selected samples show that the samples were pure haematite with the exception of sample CH-19A which may contain trace goethite (Bao and Koch, 1999). In the 1999 study, haematite samples were converted to O2 by CO2-laser fluorination and analysed for δ18O on a Thermo Finnigan MAT 252 isotope ratio mass spectrometer at the Geophysical Laboratory, Carnegie Institute, Washington. The O2 yields were at or near 100 % for these samples with a precision of ±0.05 ‰ and duplicate analyses being within 0.3 ‰ for δ18O (Bao and Koch, 1999). Water with a known δ18O composition (-8.0 ‰ ± 0.1 ‰) was used for all synthesis solutions. The water that was used is doubly deionised New Jersey tap water. The δ18O of the water was determined by CO2 equlibration on a Micromass Isoprep 18 automated water analysis system interfaced with an Optima isotope ratio mass spectrometer at the Department of Geosciences, Princeton University (Bao and Koch, 1999). Further details, descriptions and notes on the above procedures can be found in Bao and Koch (1999). New analysis of the haematite samples from Bao and Koch (1999) was conducted at Louisiana State University. Haematite samples were analysed for triple oxygen isotope composition as O2 on a Thermo Finnigan MAT 253 isotope ratio mass spectrometer. Precision of O2 isotope analysis is on the order of 0.03 ‰ or better for both the δ’18O and Δ’17O. Prior to conversion to O2, haematite samples were placed in a 20 torr BrF5 atmosphere overnight to eliminate adsorbed water. Haematite samples were converted to O2 by laser fluorination in a ~20 torr BrF5 atmosphere. The resulting O2 gas was purified using a series of LN2 cooled U-traps before being collected into 5 Å molecular sieve for transfer to the mass spectrometer. The triple oxygen isotope composition of the O2 derived from each haematite sample is initialy measured in dual inlet mode relative to a house standard, LSU-O2 (δ18O = 17.540 ‰; δ17O = 8.84 ‰). The house standard was initially calibrated to VSMOW using O2 gas derived from BrF5 laser fluorination of a dozen of UWG-2 samples using the same procedure described above. The δ18O (5.800 ‰) for UWG-2 is taken from Valley et al. (1995) and an assigned δ17O value of 3.016 ‰. These values give UWG-2, according to our lab reference scale, a Δ’17O (C = 0.5305) of -0.057 ‰ which is between the reported values of -0.019 ‰ and -0.113 ‰ from Young et al. (2016) and Pack and Herwartz (2014, 2015) respectively. Uncertainties for each fractionation parameter are calculated using a Monte Carlo method. The method uses the above equations, inputs for each known parameter and their respective 1 σ uncertainties. These input uncertainties include those for the new haematite δ’18O and Δ’17O measurements (±0.03 ‰), the uncertainty of the original water δ18O measurement (±0.1 ‰) and an assumed uncertainty of the Δ17O of the water used for precipitation (±0.02 ‰; C = 0.528). The uncertainty for the Δ17O of the water was chosen so that nearly all reported values for the Δ17O for tap waters in the continental United States lie within 1 σ of the central value (Li et al., 2015). A distribution of 1000 values are generated for each parameter with the same statistics as the respective parameter. These values are then processed through Equations S-6 through S-12 and the mean and standard deviation are calculated for the results. The distributions for Δδ17O, Δδ18O and Δ(Δ17O) are found to be normal in all cases, but the distributions of θ are slightly skewed. For θ, the central value is the median and the uncertainties correspond to the 84.1 % and 15.9 % quantiles giving the boundaries of the central 68.2 % of the distribution. The median is chosen, as opposed to the mean for θ, because it gives the same result as the solution using only the central values of the inputs. As a caveat, the results of the calculated haematite-water fractionation parameters given here assume that the calibrations of Li et al. (2015) and Bao and Koch (1999) for water isotope analysis are consistent with our calibration. Slight differences in calibration to SMOW/VSMOW between studies may have an effect on the calculated values of each parameter but this is not expected to be significant for the range of θ values. We utilise a Monte Carlo approach to provide a visual representation of the results of this study (Main Text, Figs. 1 and 2). The Monte Carlo models use the diatomic special case for ease of calculation because the vibrational frequency can be simply described as a function of the bond force constant and reduced mass. The model uses 1,000,000 evenly distributed randomly generated values for the secondary mass (0-300 AMU), the bond force constant (0-kUL), and temperature (200-1600 °K). The bond force constant for carbon monoxide (CO) is used as an arbitrary upper limit (UL) for the bond force constant for diatomic oxygen species. All calculations were performed in R (R Core Team, 2012). Bigeleisen, J., Wolfsberg, M. (1958) Theoretical and experimental aspects of isotope effects in chemical kinetics. Advances in Chemical Physics 1, 15-76. Levin, N.E., Raub, T.D., Dauphas, N., Eiler, J.M. (2014) Triple oxygen isotope variations in sedimentary rocks. Geochimica et Cosmochimica Acta 139, 173-189. Pack, A., Herwartz, D. (2014) The triple oxygen isotope composition of the Earth mantle and understanding delta O-17 variations in terrestrial rocks and minerals. Earth and Planetary Science Letters 390, 138-145. Pack, A., Herwartz, D. (2015) Observation and interpretation of delta O-17 variations in terrestrial rocks - Response to the comment by Miller et al. on the paper by Pack & Herwartz (2014). Earth and Planetary Science Letters 418, 184-186. R Core Team (2012) R: A language and environment for statistical computing. R Foundation For Statistical Computing. Tanaka, R., Nakamura, E. (2013) Determination of 17O-excess of terrestrial silicate/oxide minerals with respect to Vienna Standard Mean Ocean Water (VSMOW). Rapid Communications in Mass Spectrometry 27, 285-297. Valley, J.W., Kitchen, N., Kohn, M.J., Niendorf, C.R., Spicuzza, M.J. (1995) UWG-2, a garnet standard for oxygen isotope ratios: Strategies for high precision and accuracy with laser heating. Geochimica et Cosmochimica Acta 59, 5223-5231. Wolfsberg, M. (1969) Correction to effect of anharmonicity on isotopic exchange equilibria. Advances in Chemistry Series 89, 185-191.